Alex Iwobi, Odion Ighalo, Semi Ajayi, Francis Uzoho, Daniel Akpeyi, Ikechukwu Ezenwa, Ikouwem Utin, Ndifreke Effiong and Valentine Ozornwafor are the early birds as more players are expected today. Three -time African champions have already made sure of their place at the 2019 Africa Cup of Nations holding in Egypt this summer, and the encounter against the Pirates is hardly more than an academic affair. But the Eagles have spoken of a need to end the qualification series on a high and maintain reputation while using the game to kick -start preparations for the continental soccer showpiece. The first leg ended 3-0 with Odion Ighalo, Chidozie Awaziem and Ahmed Musa finding the net at Stade Linite, Victoria. 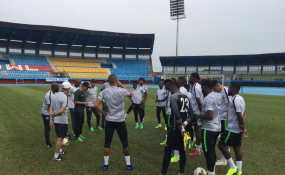 Gernot Rohr-led team will take on the Pharaohs at the same venue, four days later. Rohr called up 23 players for the two matches, with Ikouwem Utin and Effiong leaping onto the list as a result of injuries to Samuel Kalu and Ola Aina.